If you find yourself in Western Crete, among many holiday Cretan villas, you might see one with very special design, that will immediately attract your attention. 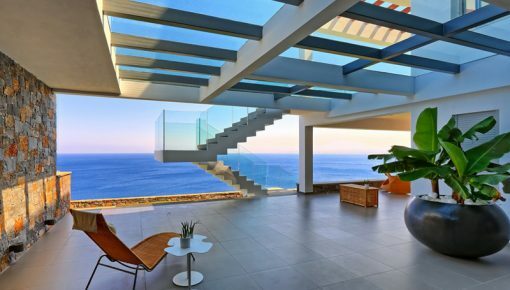 Probably, it is constructed by the popular architects Aristomenis and George Varoudakis, who have left their mark on the architecture of Cretan villas, mainly in Chania. Aristomenis Varoudakis was born in Chania, Crete, in 1947. Between 1966 and 1969 he studied at the college of San Mateo (San Francisco, California, USA) and got his pre-graduate title as “Associate in Arts”. After a five year-cycle of studies at the College of Architecture and Fine Arts of the University of Florida, he got his Bachelor of Architecture. In 1973, he got his “Master of Arts in Architecture” and “Certificate of Urban Studies”. He won the 2nd Design Award for redesigning the Town Hall of Skyros and the surrounding area, during the International Workshop of Young Architects in Skyros, with the participation of 40 young architects. Since 1994, he has been a founding member of the Hellenic Institute of Architecture. Since 2004 , he has been teaching at the Faculty of Architecture of the Polytechnic University of Crete, where he was elected Associate Professor in 2007. In 2012, he was elected Chairman of the department. 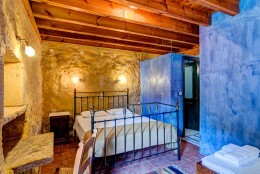 Aristomenis has left his own mark on the architecture of Cretan villas, mainly in Chania. George Varoudakis was born in 1951 in Chania. Between 1970-1973, he studied at the Department of Decorative Arts at Doxiadis School in Athens and, from 1973 to 1979, he studied at the Faculty of Architecture at the Royal Danish Academy of Fine Arts in Copenhagen. During his stay in Scandinavia, he was influenced by the minimalist trends in applied arts. He was Vice President of the Architects Association of Chania and is currently Chairman of the Administrative Board of the Municipal Gallery. Since 1981, he is in partnership with his brother Aristomenis, in Chania. Since the day of its setting-up in 1981, the architectural studio of Varoudakis brothers has undertaken small-scale projects – hotels and Cretan villas, mainly on the West side. Contemporary house design in the Mediterranean context is among the issues that especially preoccupy the architects, who are working in an area of great natural and historical value. In recent years, their work became more abstract, by simplifying the geometry of the constructed volumes and accepting austerity and symmetry as diachronic values. 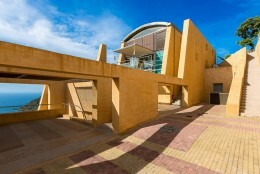 Acknowledging that reinforced concrete, like stonework, constitutes now a part of the Greek building tradition, they try to re-utilize stonework, as main wall material, in combination with the use of reinforced concrete as holding material, without any clear symbolic demarcation between the two elements. 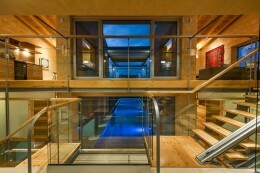 Both architects believe that this traditional amalgam offers greater elasticity and more possibilities of expression. At the same time, it can co-exist with all the older as well as contemporary building materials. 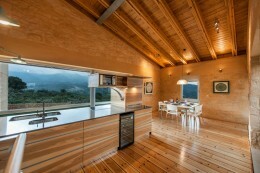 Kaminia is a brand new villa, recently built, in the beautiful village of Agioi Pantes in Apokoronas of Chania. 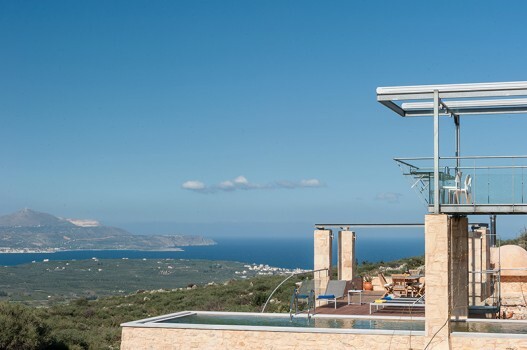 Blending the amazing view with the luxury and the exquisite architectural design, Kaminia villa, offers a unique experience of relaxation in the embrace of the Cretan nature. Adopting his own and special way of design, has the intention to preserve the traditional values by mixing natural elements with modern construction. He has taken part in over 16 architectural competitions, winning four first awards and many qualifications. 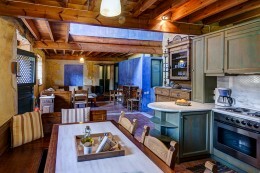 Catani Villa, located in its own hectare of olive groves in Galatas, was the first project of Aristomenis and George, concerning villa architecture. 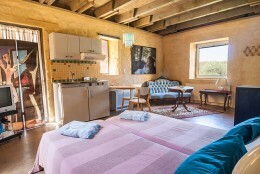 It is surrounded by mellow, unspoiled countryside and offers peaceful rural and sea views. At its most unique feature, the open tower’s decks, you can have your evening drinks while watching a spectacular sunset and then, dine at the terrace making the most of Crete’s idyllic climate, the best there is! Varoudakis brothers have envisioned a luxury, yet easy-going, country home that combines traditional elements, (thick stone walls, wooden features), with modern ones (folding glass panels, interior light wells, lookout free-standing decks at each floor) achieving a perfect balance of the exterior with the interior environment. 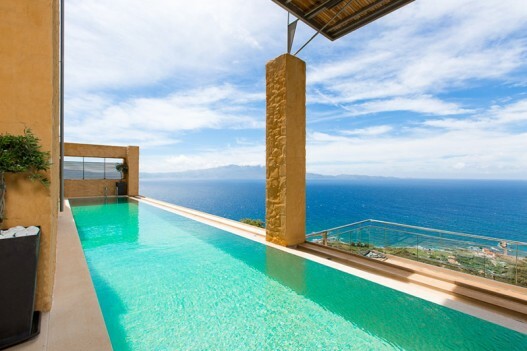 In the traditional seaside Ravdoucha village in Chania of West Crete, in an imposing amphitheatrical place with breathtaking sea view and quietness, Aristomenis Varoudakis designed 2 villas, villa Helen and villa Athena, both of them called Ravdoucha Epavlis. 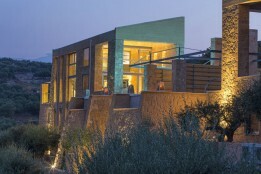 The villas are unique architectural masterpieces, surpassing the standard style, breaking the repetitive routine of other holiday Cretan villas. Countless hours of work and supervision by the architect, needed for the creation of these unique villas, featuring modern architectural elements, but also reminding of nostalgic past times. 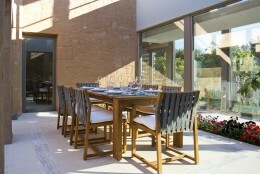 The furnishing of the villas is also designed by Mr. Varoudakis. 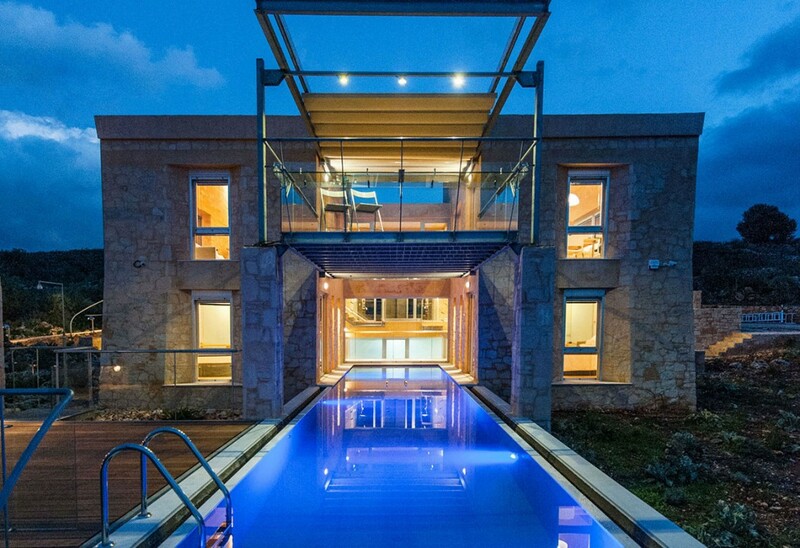 So, it is not a coincidence, that Ravdoucha Epavlis is awarded as 2015 Greece’s Leading Luxury Private Villa. 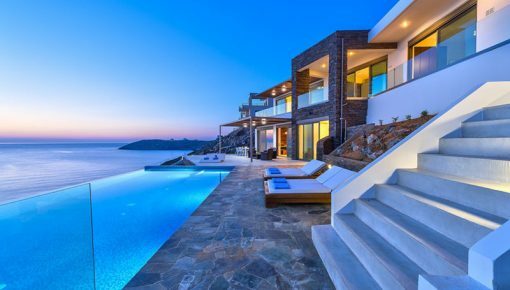 The villas overlook the beautiful Loutraki bay. 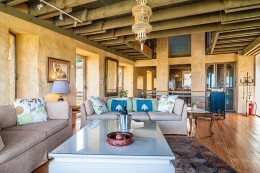 Built in stone, they are an architectural delight featuring airy rooms and large windows. The pastel interiors combine simple elegance and beautiful design with comfort and luxury. 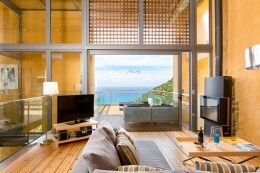 Two storey Conte Marino Luxury Villa with Breath-taking view! Strategically situated in Kontomari, a quaint and peaceful village in the area of Platanias in Chania, Conte Marino Cretan villas encapsulate the essence of traditional Cretan architectural building in today’s modern world. 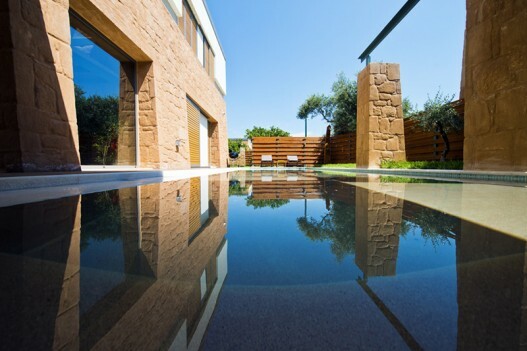 Meticulously combining stone, marble, wood, glass, earth and metal, Varoudakis brothers have invited nature in, so that indoor and outdoor become one co-existing in harmony and peace. Such achievement in design, paired with furnishing’s hand selected and exclusively designed by interior decorators, luxurious bedding and modern appliances throughout, set Conte Marino apart as the ultimate get-away destination in Crete. The villa is located in the centre of the village “Kalamitsi Alexandrou”, one of the most picturesque villages in the province of Apokoronas in the prefecture of Chania, Crete. 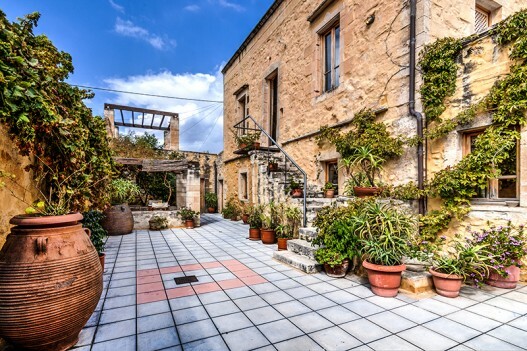 It is a two storey stone-built structure of the 19th Century, with an interior courtyard, which was renovated with respect for its history, by Aristomenis and Giorgos Varoudakis, in 2001. The home features two pools (one for adults and one for children) and has been restored in such a way, so as to be a spacious, comfortable, pleasant and functional accommodation for your vacation. 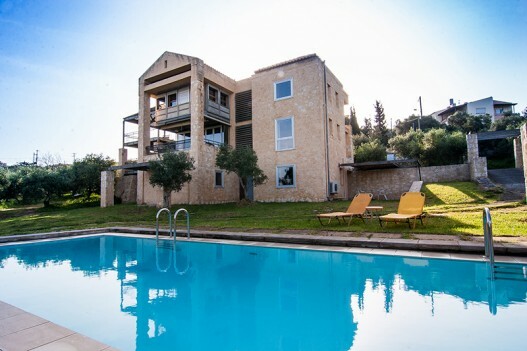 The home features two pools (one for adults and one for children) and has been restored in such a way, so as to be a spacious, comfortable, pleasant and functional accommodation for your dream holidays in Crete! Posted on 29 Jan 2016 in Holidays in Crete and tagged Villas In Crete. One-Day Trip To Spinalonga Island, The Island Of The Living Dead!